South Korean Deputy Prime Minister Kim Dong-yeon stressed Tuesday the need for a soft landing of a policy to shrink the workweek to 52 hours from 68 hours, amid overflowing reports of confusion at workplaces on how to manage the shorter hours. The 52-hour workweek is to go into effect starting Sunday, but the government and the ruling Democratic Party agreed to introduce a six-month grace period for the new scheme last week. “The government will set up a grace period until the end of this year and will lay its focus on the soft landing (of the policy), rather than crackdown on violators,” Kim said in a speech during a ministerial economy-related meeting held at Government Complex Seoul on Tuesday. On June 20, Democratic Party lawmakers and officials of the government and the presidential office in a meeting in parliament vowed leniency in carrying out the workweek regulation until the end of 2018. 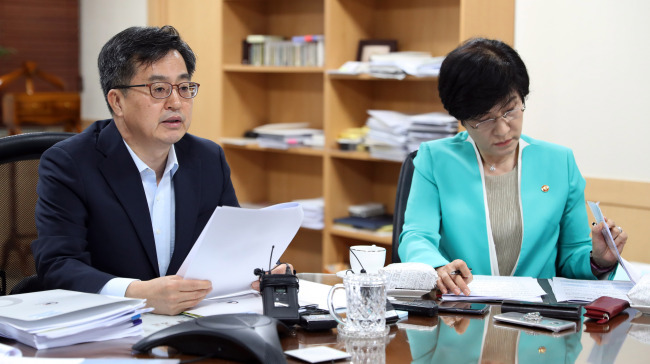 The meeting was designed to address a proposal a week prior by the Korea Employers Federation, which cited a lack of time to brace for the policy-driven shift. Prime Minister Lee Nak-yon, who presided over the meeting, said details would be discussed in the pan-governmental meeting on Tuesday. During the six-month grace period, Kim said the government will focus on discovering and encouraging model employers, instead of seeking violators. For example, working in an emergency situation, such as sudden outages of a system, will be considered an exception from the law, as long as permission is granted by the government. The meeting Tuesday, presided over by Kim, was also attended by Labor Minister Kim Young-joo, Industry Minister Paik Un-gyu and Moon Sung-hyun, chairman of the economic and social development commission under the presidential office. Hong Jong-hak, minister of small and medium-sized venture businesses, and Land Minister Kim Hyun-mee remotely joined the meeting. Reducing the workweek has been deemed one of the major pillars of the Moon Jae-in administration’s goal to lay out a policy aimed at income-driven growth, which the administration expected would take the place of export-driven growth. Following a revision of the Labor Standards Act in February, companies here with 300 or more employees are required to reduce maximum statutory work hours of employees to 52 hours a week. Violators of the law are subject to an up to two-year sentence or fines of up to 20 million won ($17,900).